The Roman Colosseum is often considered one of the most magnificent architectural marvels of ancient Rome. It was among the marks of the peak of Roman civilisations and was used to stage various public sports and spectacles such as gladiatorial fights. The term Colosseum, however, became famous centuries after its construction before which it was known as the Amphitheatre Caesareum or Amphitheatre Flavium, after the Flavian dynasty that constructed it. Other than various kinds of sports, public executions also took place at the Colosseum. The construction of the Roman Colosseum began during the reign of Emperor Vespasian in around 70 – 72 AD. Vespasian, however, could did not live long enough to see the completion of his project and the Roman Colosseum was completed during the reign of his successor and heir, Titus, in 80 AD. The main source of funding came from the spoils taken from the Jewish Temple following the Roman Siege of Jerusalem. It was built on the site of Domus Aurea which was constructed by Emperor Nero after the great fire of 64 AD. On the same grounds, various gladiatorial schools and other buildings were constructed. According to Roman historian Dio Cassius, over 9,000 wild animals were killed during the inaugural games of the amphitheatre. 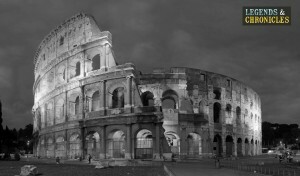 A modern photograph of the Colesseum, also known as the Amphitheatre Flavium. The Roman Colosseum was reserved for a wide range of sports and other types of entertainment of Roman life. Some of the most famous spectacles were the gladiatorial fights, public executions, hunts of wild animals, re-enactments of famous battles, mock sea battles, and various dramas from classical mythology. During the entertainment, the Colosseum would be packed with thousands of spectators and the emperor himself would be there. During the medieval times, however, the Colosseum ceased to be used as a place of entertainment and was used for housing of various religious orders and for other purposes. Careful measurements were done during the construction of the Colosseum. It was 83 meters by 48 meters, which translates to 280 by 163 Roman feet. Interestingly, the ancient Roman Colosseum had a wooden floor which, however, was covered by sand to give a more genuine look. Under the wooden floor was another elaborate structure known as ‘hypogeum’ which literally translates to ‘underground’. This underground structure, which is still visible, consisted of a two-level network of tunnels and cages which held the gladiators and wild animals before Gladiator fights. Proper connections were provided between the ‘hypogeum’ and various points outside the Colosseum. According to modern estimates, the original seating capacity of the Colosseum when it was built was around 50,000. The Codex-Calendar of 354 puts the seating capacity of ancient Roman Colosseum at 87,000 but that figure is disputed by modern scholars. The seating arrangement was tiered which also reflected the rigid class structure of the ancient Roman society. At the north and south ends of the Colosseum in Rome, special boxes were reserved for the emperor and the Vestal Virgins. A separate platform was also reserved for the senatorial class who was also allowed to bring their own chairs with them. Around the Roman Colosseum, there were various supporting buildings which were also constructed during the construction of the Colosseum. This was because the activities of the Colosseum supported substantial industry related to sports and gladiatorial training. The most famous supporting building around the Roman Colosseum was Ludus Magnus, the most famous gladiatorial school of ancient Rome, whose remains are still visible today. There were underground passages between the Ludus Magnus and the Roman Colosseum for easy mobility of the gladiators. Other important supporting buildings included Summum Choragium for the storage of machinery and Armamentarium for the storage of weapons. 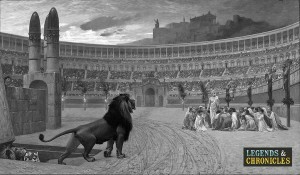 An example of Bestiarii, a group of criminals are offered up to lions in what was known as Damnation ad bestias, which is held at the Colosseum of Rome. The interior of the Roman Colosseum was very carefully and elaborately designed. As already mentioned, the seating inside the Roman Colosseum consisted of various tiers which reflected different segments of the Roman society. The most privileged seating, giving the best and most clear view of fights, was reserved for the emperor and the Vestal Virgins. A Special platform was also reserved for the senatorial class. Remaining tiers were reserved for various classes of the ordinary citizens with respect to their ranks. For instance, special sectors of the Roman Colosseum interior were reserved for soldiers, foreign dignitaries, priests, tutors, and other people. The exterior structure of Colosseum was in the form of two back to back Roman theatres. The outer wall of the Colosseum is estimated to have required over 100,000 cubic meters of travertine stone without mortar. Over 300 tons of iron clamps were used to hold these stones together. Its shape was elliptical with its length being 189 meters and its width being 156 meters. Additionally, it had a base area of 24,000 square meters. The outer wall had a height of 48 meters with the original perimeter measuring 545 meters. The Roman Colosseum is undoubtedly one of the most magnificent architectural structures of the ancient world in general and ancient Rome in particular. The Roman Colosseum began to be constructed during the reign of Emperor Vespasian in 72 AD and was completed during the reign of his successor and heir, Titus, in 80 AD. It was used for a variety of sports and entertainment, most notably for the fights of gladiators and hunting of wild animals. The seating arrangement of the Colosseum was tired which also reflected the rigid class structure of ancient Rome.